Transformation of benign endometriosis to endometriosis-associated ovarian carcinoma (EAOC) is rare; however, women with endometriosis are four times more likely to develop EAOC which can present 20 years earlier than de novo ovarian cancer. Presenting symptoms are often vague and the radiologist’s role in recognizing EAOC is critical for early detection and treatment. Histopathologic evaluation remains the mainstay for definitive diagnosis. 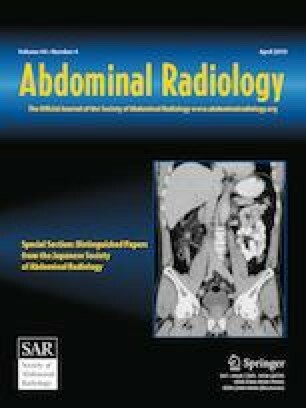 Using a case-based approach, this article will review the sonographic, CT, and MRI features of EAOC with an emphasis on MRI. Histopathologic correlation of benign and malignant endometriosis will be reviewed. Multiple factors contribute to the malignant transformation of endometriosis including genetic alterations, hormonal influences, oxidative stress, and inflammation. Malignancy most often occurs in ovarian endometriomas with less common sites involving the rectovaginal septum, rectosigmoid colon, and abdominal wall scars. The most common pathologic subtypes are endometrioid adenocarcinoma and clear cell carcinoma. MRI is the most specific imaging modality for evaluating EAOC. Key MR features include solid enhancing nodules (accentuated by subtraction imaging), nodular septations, loss of T2 shading within the endometrioma, and diffusion restriction. EAOC is a distinct disease that affects women with benign endometriosis at younger ages than classic ovarian cancer. Understanding the imaging features of malignant transformation of endometriosis is essential for early diagnosis and timely definitive treatment. This article has been selected as the CME activity for the current month. Please visit https://ce.mayo.edu/node/82192 and follow the instructions to complete this CME activity. Global Burden of Cancer in Women: Current status, trends, and interventions. https://www.cancer.org/content/dam/cancer-org/research/cancer-facts-and-statistics/global-cancer-facts-and-figures/global-burden-of-cancer-in-women.pdf.